My climbing trip didn't start until 10 AM Monday, so I had time for an early hike at Ferry Bluff State Natural Area, west of Sauk City. If you haven't driven Scenic Byway 60 along the Wisconsin River before, it is a marvelous road with great sightseeing stretching all the way from Lodi to Prairie du Chien. Because there are only occasional bridges across the Wisconsin River, Hwy 60 tends to be off the beaten path, winding through quaint towns and hilly landscapes typical of Wisconsin's driftless region, following the Wisconsin River all the way. Ferry Bluff is about five miles west of Sauk City, about a mile off the highway via a single-lane dirt road. Ferry Bluff gets is name from Civil War days, when a ferry at the base of the bluff helped farmers and their animals cross the wide Wisconsin River. In 1974, the Eagle Nature Foundation, with help from the National Wildlife Federation and funding from Anheuser-Busch, purchased the Ferry Bluff parcel to create a conservation area for bald eagles. A full third of bald eagles in the lower 48 use the Mississippi River Valley flyway for winter fishing grounds, making this site an important a roost area hosting 30 - 80 baldies each winter. 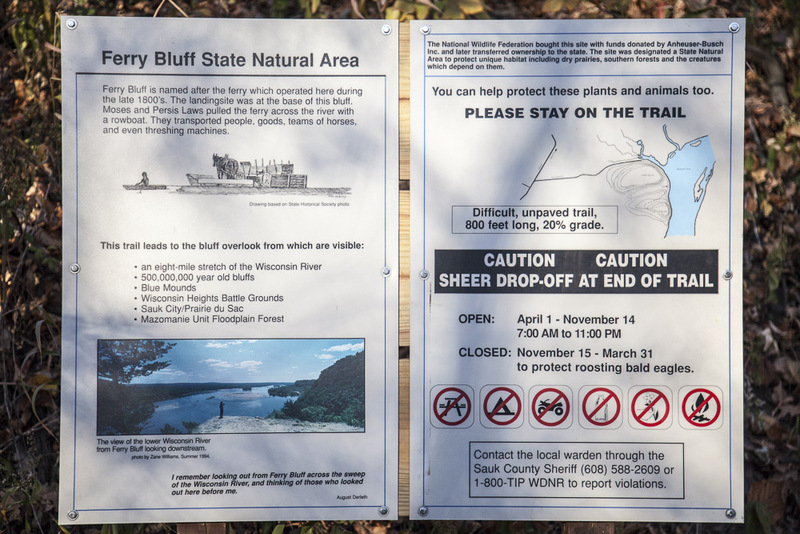 To protect the roosting activities, hiking is not allowed at Ferry Bluff Nov. 15 - Mar. 31. A small parking area at the trailhead accommodates maybe 5-10 cars, and two informational signs lay out the trail system, topography, and a historical overview. Honey Creek flows immediately north of the parking lot, providing a nice put-in for paddlers embarking on Wisconsin River trips. 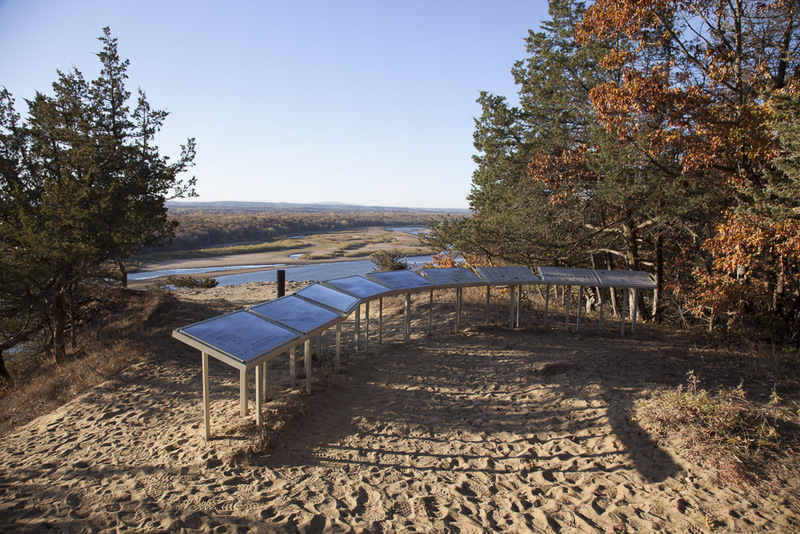 The Ferry Bluff trail leads through a open oak forest to two ultimate destinations: a sandy beach along the Wisconsin River, or a high lookout at Cactus Bluff, 300 feet above the river. I chose the bluff trail, which led up a draw between Ferry and Cactus Bluffs following well-maintained switchbacks. Atop Cactus Bluff, a wide arc of interpretive signage lays out human and natural history highlights and points out the landmarks in the distance. On a clear day (which this was), you can easily see the high point of Blue Mounds State Park in the distance, a soft, low knob to the southeast (see images). From Cactus Bluff, a thin but well-defined trail takes you directly up a ridge to reach the blufftop above. Follow this trail as it eventually bends north, taking you to the higher Ferry Bluff. No signage points out or explains this trail, but it is easy to follow and leads to a another beautiful view. From Ferry Bluff, you can see the wide, expansive namesake of Prairie du Sac to the north and the small buildings of Sauk City and Prairie du Sac. Ferry Bluff State Natural Area has a second parcel, Hugo's Bluff, to the south, but this area may only be accessed by boat, as private land prevents hiking trails from connecting the two areas at this time. If you find yourself floating by Ferry Bluff on a Wisconsin River paddle, the Hugo Bluff beach is a great one for camping, and you might stop by Ferry Bluff to stretch your legs with a short hike.